Since the Windows 10 April 2018 update, I've been fixing and figuring work arounds for all the problems that MS anointed me with from that update. One thing I've noticed since then is CCleaner is taking much longer to complete then it did before. What was a 25 sec job has become a 300 sec job. It has always been slow on the MS stuff, Edge and Explorer are always the longest cycles even though I use neither and I don't think that has changed. What is noticable is System > Temporary Files. When CCleaner gets to S>TF, it slows to about 1 file per second. Once it is past S>TF it speeds along nicely. I'm sure this is somehow connected to the Windows 10 April 2018 update. Would anyone know if this issue points to a specific conflict, and can it be fixed? All suggestions, ideas, comments any wish to offer will be greatly appreciated. Thanks, K.
right click on System > Temp Files and hit Analyse. Thank You mta for considering and responding to my post. I am unable to find System > Temp Files on my system. I've used the Search function in Local Disc (C:), as well as This PC. I've started CCleaner and when it started cleaning System > Temp Files I right clicked on that - nothing. Would you have any idea where System > Temp Files may be on my system? Thanks, K.
Before you clean anything then right click it and then click 'Analyze Temporary files' in the pop-up menu. That will show you how many files are there waiting to be cleaned. Never thought of looking in the CCleaner menu. Just did the analyze. See attached. Thank You, K.
so there's 25GB's & 13,000 files - that's a lot of temp files! when was the last time you cleaned them? you can double click that line and it'll show you all the culprits. click the Size column header (twice) to get them sorted in descending order to see the worst offender and screen shot that for us (well, for me, just curious really). buy, yeah, 25GB's will take CC a while to clean. faster option may be to use Windows inbuilt cleaner called cleanmgr. click the Start button, start typing cleanmgr and click the Disk Clean-up app found under Best Matches. make sure all the boxes are ticked and hit OK.
that'll clean up those temp files and for future reference cleanmgr can actually do a lot more but this will get you over your current hurdle. Thanks nukecad and mta for your help. I clean every evening. First I drop down the menu from the 3 dots in the upper right hand corner > click Settings > scroll to the bottom > click Advanced > scroll to Clear browsing data > Clear data. Next I open CCleaner and clean with it. This is the same procedure I've been following for years. The mid April Windows 10 update was not kind to my system. The other 4 systems in our network didn't seem to suffer like my system has. It was about that time I started noticing the change in cleaning time. I'm using my system the same way I did when the cleaning time was always near 30 seconds. Nothing has changed except the W10 update. So far I've corrected or found workarounds for all but a few aggravating issues. 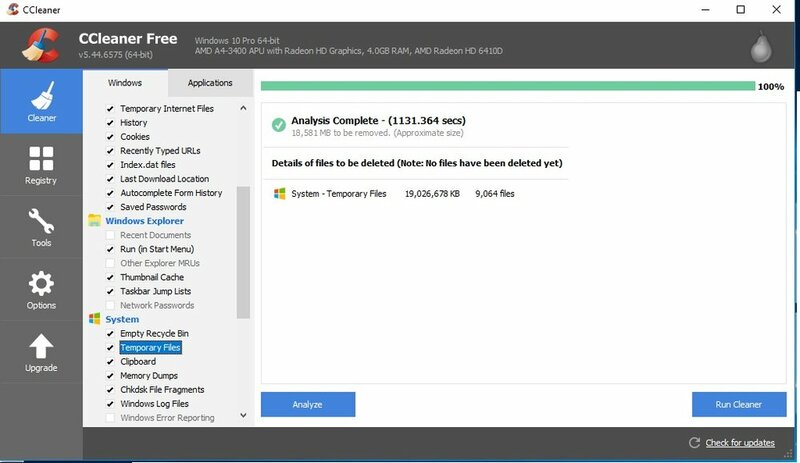 I was hoping others had suffered the drastic change in CCleaner cleaning time, discovered the reason for the issue and found a repair procedure. Maybe that fix would solve at least one of the nagging W10 update issues I haven't been able to solve. A couple things I don't understand about this CCleaner issue is, CCleaner seems to speed through all other tasks except S>TF. There it plods along at roughly 1 file per second. Is that normal? Why is the cleaning process so long for Internet Explorer files when I don't use Internet Explorer and haven't for years? Through the years and versions, on my system, cleaning Internet Explorer files has always been a noticeable long process. When I went cleanmgr > Disk cleanup, there were no boxes to check (attached) so I didn't continue. Apparently I didn't do something right. Again, Thanks All, appreciate your help. K.
You then select the boxes for the ones with files found and click OK. If you can't see this stage then it would suggest there may be something wrong with your system. (and you may want to run the system troubleshooter). But before you go as far as the troubleshooter there is another option to try. 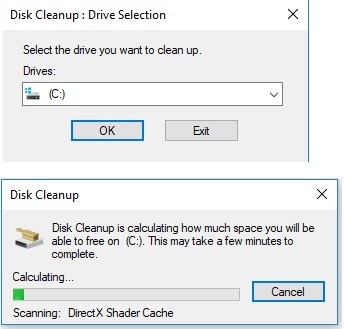 In the latest Windows 10 versions there is also 'Storage Sense' which does a similar job to Disk Cleanup just in a different way. (It's also easier to use than Disk Cleanup for most home users). With the start menu open start typing Storage and it should be the top option that shows. Select that and then 'Free up space now' and wait while it scans the disk. Once its finished tick the boxes for what you want cleaning and then click 'Remove Files'. If it finds 'Previous Windows Installations' and/or 'Delivery Optimisation Files' to clean then you may want to leave them unticked for a first clean and do them later. If found then those 2 will take a long time to clean, up to an hour on some systems. 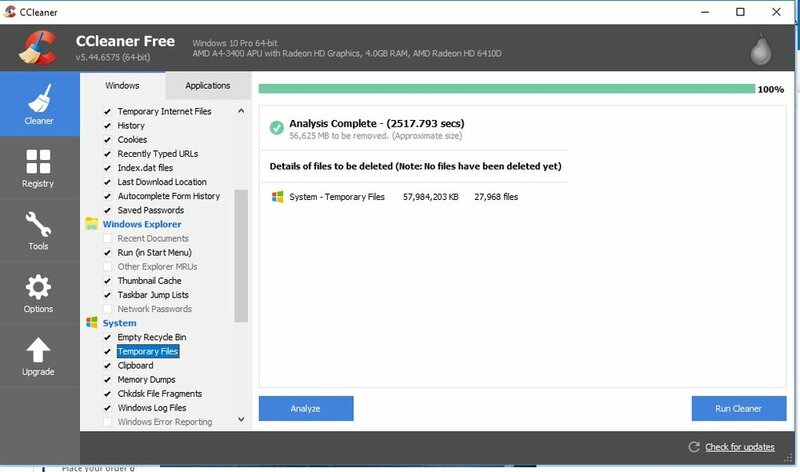 Storage Sense can also be configured to clean up the Windows temporary files itself, daily, weekly, monthly, or when Windows decides. Once set it does this automatically in the background. You'll see the slider button and the 'Change how we free up space automatically' options once you open it. Like mta says you do seem to have an excess of temporary system files for some reason, which will initially take a while to clean. I suspect that they are mainly leftovers from the April 2018 update. (These, and other update files, usually get automatically removed in the background after 30 days). When did you actualy install the update on your PC? 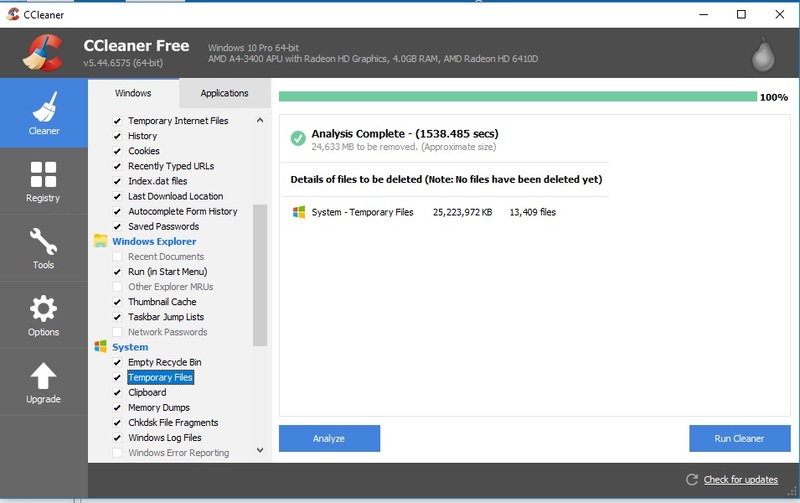 I analyzed S>TF about an hour after doing the Disk Cleanup thing. Here are the results. Any ideas what this means? Thanks, K.
It means that something is creating a hell of lot of temporary files, that are not getting removed. 32 GB in 14,560 files created in just 4 days is going some. (Are you downloading a lot of video or music files perhaps?). If you can do as mta suggested above and list the files then it may give some clue as to what is going on. You can right click on that result and select 'view all files', or in CCleaners Options>Advanced select the results to'file list' before analyzing. Once you have the files listed clicking on the 'size' column header twice should bring the biggest files to the top so you can then screenshot them. (Don't try to screenshot all 28 thousand. LOL). Thanks hazlenut. That's what I was expecting to find, it's not a CCleaner problem. If MS ever comes out with a fix for the April 18 update, i would expect this problem to evaporate. Thanks All, appreciate the help. K.
start an elevated command prompt and type wsreset and hit Enter. that will 'reset' the Windows Store. Thank You mta for offering to help further but since I have no idea what an elevated command prompt is, I probably otta stop at this point. In addition, I suspect if MS ever gets W10 fixed (yes, I'm aware of what I just said) CCleaner and all my other W10 issues will start working correctly again. Thanks, K.
an 'Elevated command prompt' is simply running the command window as an Administrator (See Solution 3 below). The command window is where you can type in DOS and other commands, just like we all used to use before this fancy 'Windows' thing came along. It can have options that Windows doesn't. You don't need to know all the commands to use it, just open it and type in, or copy/paste, exactly what the tech helper says to. When you've finished close it just like any other window, or just type exit. Of course like anything else, if you are not confident doing it yourself then ask someone who is to help/show you. Solution 1 shows how to manually delete the temporary files using 'run'. Solution 3 is an example of using an 'Elevated command prompt' to delete the temporary files in one go. (Note that newer versions of Win10 may show Powershell on that menu instead of Command prompt. You can use either - Powershell is an updated version of Command prompt, it stands out because it has a blue screen instead of black). (If you specifically want a command window like in the article and not powershell then with the start menu open type cmd, right click on Command Prompt and select 'Run as administrator', then click yes in the pop-up). You've already tried 2, 4, (4 tells you to run CCleaner, LOL) and I assume 5. 6, 7, & 8 give further fixes to try; 6 or 7 in particuar may be the cause of your problem. And don't forget mta's reset for windows store above. Hopefully one (or more) of those will give Windows a kick in the pants and start it working properly again for you. Thanks All for all your efforts. The problem is solved. Ccleaner now runs fantastically on my system. Three weekends ago lightening fried my system. Yesterday the replacement was installed. It even solved the April 2018 Windows 10 MStastrophy I've been living with for the past 7 months. Again, Thanks to everyone for all their effort. K.